Girl Kuripot Girl Kuripot: Exotic Philippines, Win a Cebu Stay & Tour! Exotic Philippines, Win a Cebu Stay & Tour! This is a chance to win a 3D2N stay in Cebu with a tour via Exotic Philippines! You have until January 29, 2012! Warning: the entries to join here are too much and may be a little tiring. As always, I suggest you only join and like those you are interested in. There are also two consolation prizes with 2D1N Stays. Do take note of the validity. 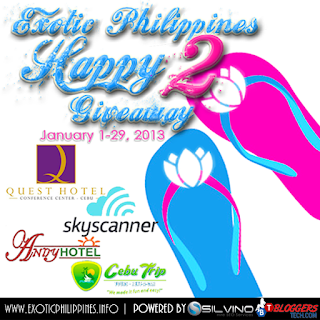 Click here to join the Exotic Philippines Happy 2 Giveaway. AXN Asia, Win a Trip to Mt. Apo! Ipanema Philippines, Win a Trip for 2 to Brazil! New Keeping It Together Winners! Topaz Mommy, Win a Studio Stay in Tagaytay! Bo's Coffee, Snap Cebu Sinulog & Win Bohol Trip! Between Bites, Win a Studio Stay in Tagaytay! Qatar Airways, Win Flights to Doha! Dencio.com, Win an Overnight Stay in Manila! Giveaway: Les Miserables Premiere Tickets! Axe Philippines, Win a Trip to Outer Space! Out of Town Blog, Win Stays in Tagaytay or Bohol! ZTE, Win a Trip to Bali! Join the PAGCOR National Photography Competition! Business Traveller Asia, Win a Stay in HK! DestinAsian, Win a 3N Stay in Bali Seminyak! The Pickiest Eater, Win an Overnight Stay! Mt. Pulag, Win a Trip for 2! Jo Tan, Win an Overnight Stay at Taal Vista! Lonely Planet, Win a Photography Tour of Bhutan! Giveaway: Keeping It Together KIT!